According to the National Association of Broadcasters (NAB), the transition from analog to digital TV is moving forward, despite the lack of affordable HDTV sets. The price of an integrated HDTV receiver hovers around $2,500.00. To speed up the digital transition, NAB recommends a program to educate customers that analog TV sets purchased these days will be obsolete in the near future. But what is the definition of near future? Everybody agrees that the current 2006 cut off date is unrealistic, but nobody as yet has suggested a “firm” new schedule. The good news: Over-the-air DTV reception offers a high value for CATV engineers. Receiving and carrying distant low-band TV stations on cable, the days of aggravating electrical and co-channel interference, are over. The analog programs, carried by the station’s DTV affiliate, can be received free of noise and AC interference. The improvement in picture quality can be spectacular. And now the bad news: The dual, simultaneous analog and digital transmission represents a serious financial burden on TV stations which have a tendency to reduce output power, or turning off the DTV transmitter under the pretense of periodic maintenance. The net result: the HDTV pictures break up or disappear completely at the receiving facility site. However, pictures with some background noise or low level interference are still better than no pictures at all. Therefore, keep those VHF antenna-arrays on the tower, as well as the signal processors ship-shape, the backbones of a stand-by system. You never know when the channel has to be switched back to analog. Another important question: How are CATV engineers adjusting to the exponentially more complex DTV reception technology? With nearly 1,500 DTV stations on the air, adding to the currently operating 1050 analog UHF stations, the 470 to 800 MHz frequency range has become overcrowded. Severe adjacent channel interference conditions are the norm, not the exception these days, as demonstrated on the photographs below. Canvassing DTV reception technology from every point of view, we found that not all UHF DTV stations transmit with the authorized 1000 kW maximum output power, nor are all transmit antennas installed at 1350 ft above average terrain. Consider the case of Channel 45, WABC-DT, New York and Channel 44, WNYW-DT, New York, the FOX flagship station. Both transmitters are located on the Empire State Building. Both transmit antennas are at or near 1200 feet above ground. However, while the Fox station operates a 990 kW effective radiated power transmitter, the ABC flag station emits only 200 kW. When using a UHF antenna or antenna-array to receive both stations, it makes common sense to determine the minimum antenna height by making a calculation based on the lower output Channel 45 transmitter. Another interesting case is Channel 44, WNCN-DT, Atlantic City, a station which returned its analog license to operate exclusively a digital transmitter. The first observation: the station is located in Camden, N.J., not in Atlantic City. Second, the transmit parameters of this station are way below average: 200 kW output power, a 663 ft high antenna tower. Third, the DTV Reception Study shows that the Channel 44 signals are not free of interference. The reception is affected by a strong co-channel station, Channel 44 WNYW-DT, New York, as well as adjacent channel interference from Channel 43, WNJT-DT, Trenton. The selection of Channel 44, for digital operation was not a very good choice. Apparently, somebody did not have the proper interference study at his or her fingertips. 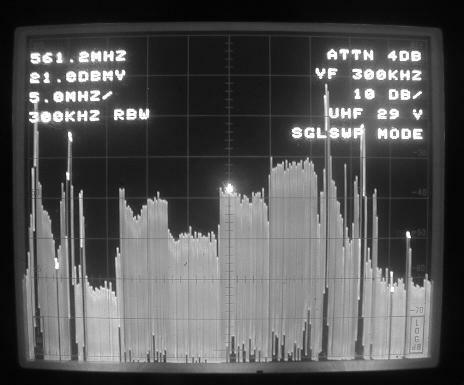 While the original Swiss Army Knife was developed to give soldiers the best collection of survival tools, Biro Engineering’s Computer Aided HDTV Reception Studies is aimed for a similar objective: to assist the CATV engineer with essential DTV information. Our Computer Runs and Signal Direction Sheets, delivered next day, not two weeks later, will prevent costly mistakes and unnecessary disputes. 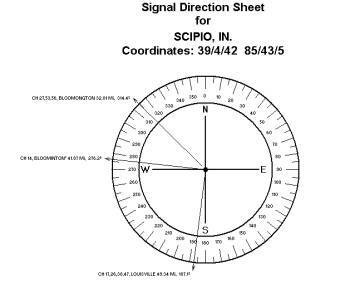 The Signal Direction Sheet on the left is a visual presentation of all DTV stations in a 50 mile radius, the perfect aid to conduct an efficient on-site signal survey. No DTV stations should be missed, nor the survey antenna unnecessarily moved. 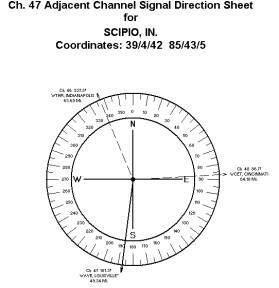 The special, adjacent channel interference direction sheet on the right will be the engineer’s best tool to identify interference sources and the intensity of the interference. Distant HDTV Reception criteria tend to follow traditional analog UHF reception rules, enhanced by worst case (inclement weather) scenarios. 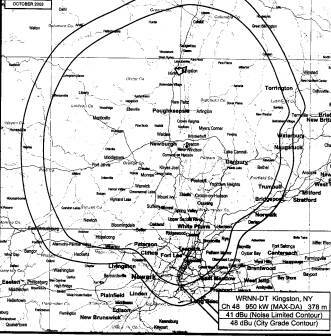 That inclement weather affects UHF reception is not a new concept. While analog pictures have a tendency to slowly deteriorate into a noisy background, HDTV pictures shine until the last moment, then they disappear abruptly. 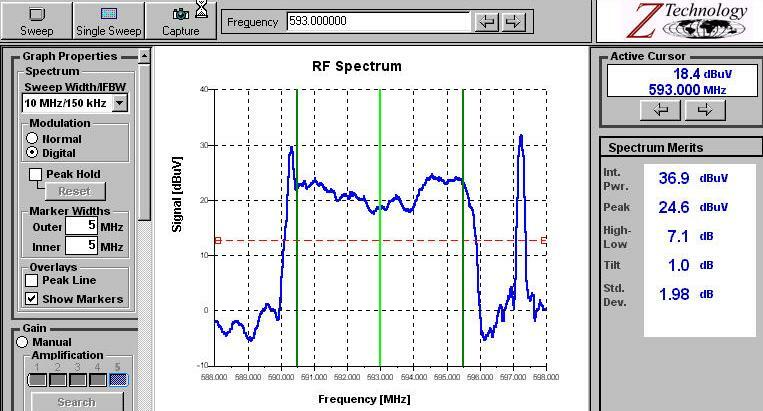 Two RF spectrums were recorded from the same Philadelphia DTV station under fair (above) and inclement weather (below) conditions. The difference is dramatic, not only in the reduction of signal level (more than 10 dB), but also in the frequency response. 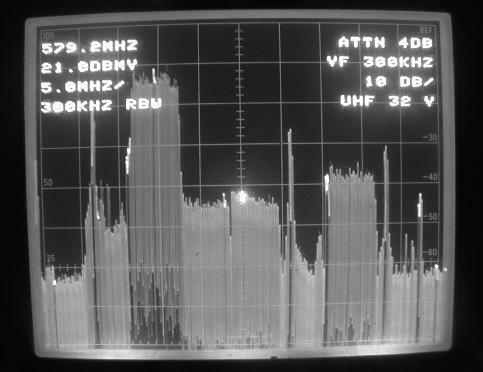 Observe the dips and humps in the 5 MHz wide power spectrum on the lower picture, sharply increasing the Bit Error Rate (BER) count. The HDTV reception update would be incomplete without a few notes on the issue of DTV MUST CARRY. The new DTV only stations developed an aggressive posture demanding signal carriage in distant CATV systems although they have zero audience in the area. Why would anybody install a UHF rooftop antenna oriented toward North, when 20 New York analog and DTV stations transmit from the Empire State Building? However, broadcasters developed an ingenious mechanism, called the LONGLEY-RICE Grade “B” contours to circumvent the zero audience issue. It is a computer developed map, projecting optimistic DTV signal coverage for the area. 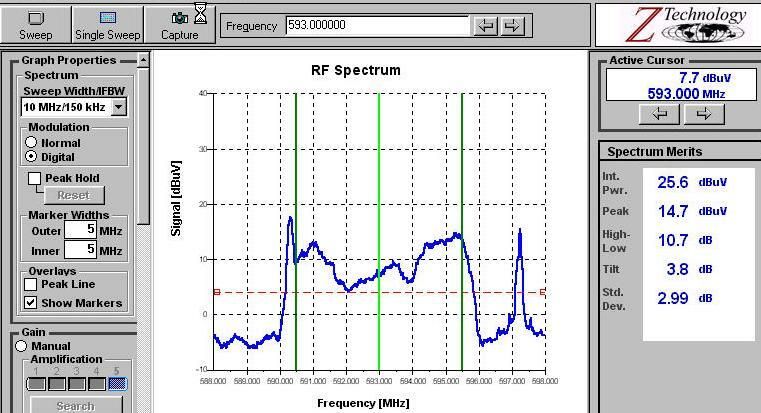 The LR signal strength projection completely disregards adjacent channel interference problems. Field tests have indicated that the projected signal levels can be 7 to 17 dB stronger than levels obtained during the signal strength verification survey. Inclement weather conditions are completely disregarded. Last but not least, when the theoretical Grade B contour shows a single hump (see picture below) toward a critical coverage area (Manhattan), the program manipulation is a valid assumption. Namely, projected radiation patterns are created by equations (formulas) containing, without exception, sine or cosine trigonometrical functions. Consequently, the deviation from the omnidirectional radiation pattern must occur in all four quadrants. A single hump, like that one above, was perhaps created on a drawing board, to be rejected by the FCC examiner or any other competent authority. CONCLUSION Even if it comes close to sacrilege, there is no question that HDTV picture quality is far superior to those observed on analog channels. Perhaps an even higher level of heresy is that despite the 120 or more satellite channels on cable, the majority of the prime time audience still watches the highest rated network shows, which are broadcasted over-the-air by VHF and UHF stations. The message is loud and clear: Keep your HDTV reception facilities updated and in top condition.